Pressure from those concerned that the EU-US trade deal would hand over too much power to foreign corporations has been working on both sides of the Atlantic. Campaigning works. This is the clear message from a rollercoaster week in the struggle over the Transatlantic Trade and Investment Partnership (TTIP), the controversial trade deal being negotiated by the EU and US behind closed doors. 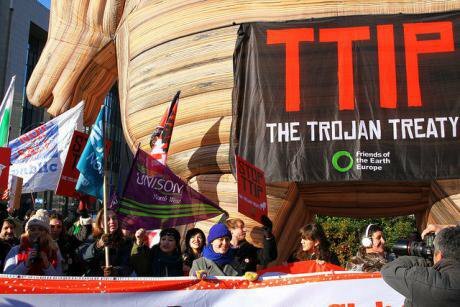 People power has knocked TTIP backwards on both sides of the Atlantic, sending its proponents into a tail spin. For all those who have taken action as part of the NoTTIP campaign: we are winning and they are losing. The European Parliament was asked to pass a pro-TTIP resolution on 10 June that would have given the EU trade commissioner Cecilia Malmström a new boost in her efforts to complete the deal. Along with other civil society representatives from across Europe, I travelled to Strasbourg in order to remind MEPs that over two million people have now signed a European Citizens’ Initiative rejecting TTIP and the parallel EU-Canada deal, CETA. If MEPs wished to maintain any credibility, we told them, they must vote down the pro-TTIP resolution. The people of Europe would be watching. The intense pressure built up by campaigners over the past weeks was effective. The German social democrats who control the parliament’s agenda (and support TTIP) were so rattled that they cancelled the vote at the last minute. They then allowed an 8am motion to go through from the parliament’s conservative group blocking any further debate on TTIP, even before some MEPs had realised the motion had been presented. As many commentators observed, this was not democracy’s finest hour. The rejected resolution had been billed as the first statement of support for TTIP from the new European Parliament elected last year. The fact that neither the vote nor the debate could take place is a blow to the legitimacy of the TTIP project, and to the credibility of the EU’s free trade agenda. So what had actually happened? The parliament was abuzz with questions as to why its president, Martin Schulz of Germany’s social democratic party, had taken the decision to stop the vote from going ahead. The official reason (that the number of amendments made it too complex) was dismissed by all sides as an obvious smokescreen, as the parliamentary procedures were perfectly capable of dealing with the vote. In reality, as most media reports concurred, the social democrats are in crisis over their support for TTIP, and deeply divided over the inclusion of an investor-state dispute settlement (ISDS) mechanism that would allow US corporations to sue EU member states for loss of profits resulting from public policy measures that might affect their bottom line. 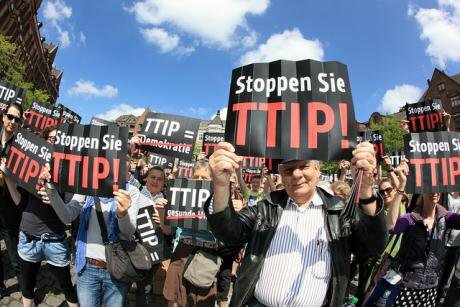 ISDS has become the lightning rod for the current wave of protest against TTIP, even though many of the agreement’s other elements are equally dangerous. MEPs have come under intense pressure from civil society to speak out against the inclusion of any ISDS mechanism in the deal, including the “new” version of ISDS proposed last month by Cecilia Malmström with its minimal, cosmetic reforms. Social democrats have come under particular attack for backing a deal that might hand over such powers to big business, and several Labour MEPs have committed themselves publicly to voting against TTIP in the final analysis if it includes any form of ISDS. As we were told again and again in Strasbourg, relentless public pressure has made the difference in forcing MEPs to take a strong stance on ISDS. Without that pressure, the pro-TTIP resolution could well have gone through. Martin Schulz. Flickr/PES Communications. Some rights reserved. The German leaders of the social democrat group in the European Parliament seem oblivious to these concerns, and to the reputational damage that their unquestioning support for TTIP is causing MEPs in their sister parties. Internal meetings of the social democrat group have become increasingly acrimonious as French and British MEPs complained to the group’s leaders that they are under attack from their constituents and from trade unions for supporting the TTIP negotiations. The Germans, by contrast, are playing a higher game trying to hold together a “grand coalition” with the powerful conservative and liberal groups in the European Parliament, much as they do as junior partner to Angela Merkel in Germany itself. Support for TTIP is just one part of that game. 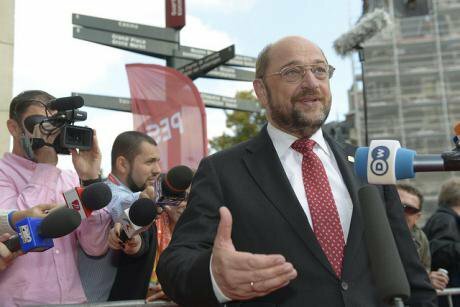 In the final analysis, however, the parliament’s president Martin Schulz was unable to satisfy his masters in the grand coalition and at the same time respond to the concerns of his fellow social democrat MEPs. If he had allowed the vote on the TTIP resolution to go ahead on 10 June, he would have had to quash a rebellion from a large number in his own group who had formed their own coalition with more radical groups from left and right in an amendment deleting ISDS from TTIP. If the anti-ISDS amendment had succeeded, on the other hand, Schulz knew that his partners in the grand coalition would have voted down the entire resolution, fatally undermining his authority. By cancelling the vote he avoided either eventuality, but failed to address the underlying problem. Instead, the parliament’s trade committee was told to take back the resolution and try again. The crisis for proponents of TTIP goes deeper than individual votes or debates. As more and more details emerge showing how the agreement will inevitably cause significant social and environmental damage, it becomes increasingly impossible for “progressives” to maintain their support for the TTIP process. The conservative and liberal groups have no difficulty in backing free trade and investment agreements that are designed to benefit business at the expense of others. The social democrats, by contrast, are supposed to stand for high standards, labour rights and a more equitable form of capitalism. Any support for TTIP looks like a betrayal of their values. And the costs of TTIP will be significant. Calculations made by the Centre for Economic Policy Research in the official impact assessment undertaken at the start of the talks in 2013 show that at least one million people will lose their jobs as a direct result of TTIP, in the EU and USA combined. An “ambitious” TTIP, as originally hoped for by the European Commission, will cost over two million jobs. Reflecting on what the net effect of such massive dislocation would be, the commission acknowledged that there are “legitimate concerns” that people forced out of their jobs by TTIP will be unable to find new work. With unemployment in many European countries running at record levels, the addition of hundreds of thousands more people to the ranks of the jobless will be a social catastrophe. No amount of money from EU support funds can make up for the destruction of local economies in the face of unequal US competition. The ecological damage that TTIP will inevitably cause is another compelling reason to reject the entire process. Yet the European Parliament resolution would have welcomed the prospect of TTIP opening the floodgates to US exports of oil and shale gas, locking us in to dependency on fossil fuels for decades to come. The European Commission’s own calculations recognise that TTIP is bound to increase CO2 emissions at a time when we are urgently required to cut them if we wish to have the slightest chance of halting irreversible climate change. The planet will be a loser under any TTIP agreement. MEPs must abandon the delusion that their support for the TTIP process will put them in a position to craft a “good” TTIP or a “TTIP for the people”, as some have tried to claim. TTIP is expressly designed to subordinate all higher social and environmental values to the free market, removing “regulatory barriers” that might prevent transnational corporations from maximising their profits, even if that conflicts with the needs of people or the planet. Any talk of using the negotiations to raise standards or set positive rules for the global economy is a fantasy. While the above debate was raging in the European Parliament, the US Congress was going through its own TTIP contractions. The US debate has centred on the “fast track” powers that President Obama needs to secure if he is to negotiate TTIP to its conclusion without referring every line to Congress for approval. The bill preparing this Trade Promotion Authority managed to pass the Senate, but there were huge doubts that it could pass the House of Representatives – not least because the same power would also apply to the parallel Trans-Pacific Partnership (TPP) that the USA is negotiating with Asian and Latin American nations, which is seen as an even greater threat than TTIP. In a surprise move, Obama suddenly called for a vote on fast track in the House of Representatives on 12 June, just two days after the European debacle, and turned up himself in Congress to plead for the support of his fellow Democrats. They refused to back him, and delivered what many US commentators were quick to describe as the most serious defeat of his presidency. US trade unions had mobilised huge opposition to the fast track vote, and ultimately Obama fell way short of the numbers he needed. It was a nasty blow. We are far from the end of the story on TTIP, as negotiations still have years to run before they have any chance of reaching a deal. The campaign is making the talks more toxic with every passing day, and many national parliamentarians are now trying to distance themselves from the agreement due to its growing unpopularity with their constituents. To repeat: people power is taking effect. Yet we need to remain vigilant for every new attempt over the coming weeks to secure support for TTIP from the European Parliament, Congress or any other body. In particular, we need to resist the siren calls from those who would have us engage with the TTIP process in order to win the “best deal possible”. Giving TTIP the green light now in the hope of stopping it at the eleventh hour is a recipe for disaster. We have the power to defeat TTIP entirely and to demand an alternative trade politics in the service of people and the planet. For this, we will continue to maintain a strong international campaign of outright opposition to TTIP, CETA and all other free trade deals. The people have spoken. The politicians would do well to listen. This article was originally published on War on Want.